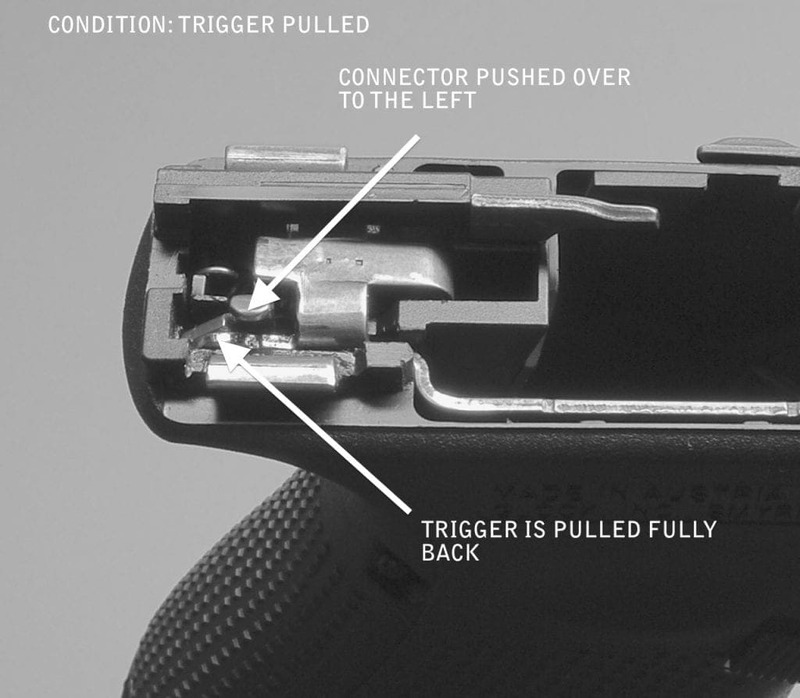 The trigger connector is a very overlooked and misunderstood part of the Glock, but it fulfills a very important function. An aftermarket trigger connector can be an exceptional value. Let’s look at what this part does and why it’s worth an upgrade, as well as the best parts on the market. What is a Trigger Connector? The trigger connector is often overlooked, but it’s vital: this part moves down the sear from the striker, after the sear itself has pulled back the striker. Aftermarket trigger connectors perform this function either sooner or later following the trigger being pulled. Translation: you’ll get a lighter or heavier pull. Additionally, some aftermarket triggers also introduce an additional projection that can be filed away until only enough room remains for the sear to fall before the trigger stops. This is a bit more intensive, but as you can see, in a nutshell, the trigger connector is key to customizing your trigger pull. ​While this is a matter of taste, finding the ideal response to your trigger pulls and natural finger motion will greatly enhance your reactivity. For newer gun owners, this will be a trial and error process, but it is absolutely worth determining. The only way to really fine-tune this aspect is with an aftermarket trigger connector. ​The lower pressures available—such as 3.5 pounds—provide a fast recovery time that is highly suitable for competitive shooting. This might be too loose for concealed carry, where 4.5 pounds is better. However, for sport, this drastically reduced pressure is excellent. ​While this factor is also a matter of taste, determining when the trigger stops with some aftermarket trigger connectors can enhance shooting speed between shots. ​​A quality trigger connector can enhance the smoothness of a trigger pull, whereas a poor one will do just the opposite. The Glock OEM trigger pull falls in the middle of this range. ​This factor is often overlooked for smaller innards like the trigger connector, but a gun is a complex machine that only requires one part to break or malfunction before the entire handgun stops working. Upgrading to a quality trigger connector mitigates the potential for this problem. While the OEM trigger connector is fine, there are better materials, such as stainless steel. Now that you know what a trigger connector does, you’re one step closer to fully understanding your Glock than the average owner. But that’s only half the battle—now, it’s time to upgrade your trigger connector for a more custom pull. Read on, keeping in mind which aspects you would like to control. 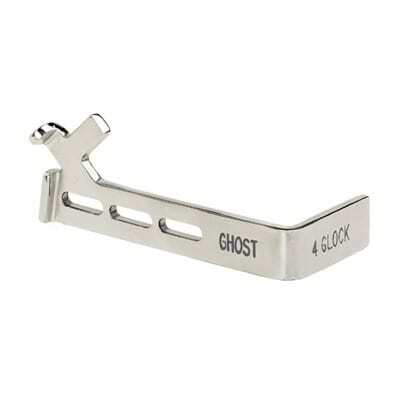 Ghost, Inc is one of the most popular brands when it comes to trigger connectors and for a really great reason: their trigger connectors are made from high-quality parts and include all the great features you need to fine-tune your pull. Made from stainless steel, the Ghost Rocket 3.5 Trigger Connector is durable and will last a long time, so you don’t need to worry about a small and delicate inner part that you don’t see too often breaking or failing at seemingly random times. The 3.5 model from Ghost reduces your trigger-pull weight down to 3.5 pounds. Meanwhile, an extra tab included with the trigger connector ensures that there won’t be overtravel when the striker falls. If all of this sounds like a difficult installation awaits you, worry not: in addition to our in-depth walkthrough at the end of this article, Ghost includes a very detailed and illustrated guide to installation. We can’t thank Ghost enough for being manufacturers who include helpful pictures rather than straight-up text. Once installed, you’ll enjoy a much quicker recovery and thus, greater accuracy. However, be aware that when you reduce your pull weight, you’ll need to retrain your muscle memory. The amount of time this takes will be different for every owner, but in general, a session or two should have you shooting with improved results. For those who would like a lighter trigger pull and a limitation on the ability to over travel, the Ghost Rocket 3.5 Trigger Connector will have you shooting like a rocket indeed. 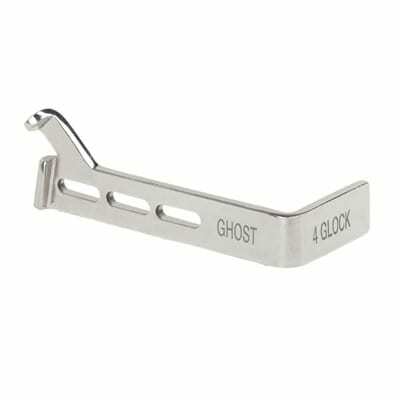 As we’ve stated, Ghost is a premier brand in trigger connectors, and as such, this is our second product on the list from them. The Ghost 4.5 Ranger Trigger brings a smooth, 4.5-pound level of pressure-resistance to your trigger pull, creating a lighter and silkier shot. This trigger connector is perfect for Glock owners who want a more incremental change in their trigger connector than the Ghost Rocket. First of all, it operates much more smoothly than the stock trigger connector. It also improves product durability, as it is made from stainless steel. However, it also improves speed to a lesser degree than the Rocket but is faster than the stock. Either the smoothness or the increased speed taken by themselves don’t add much, but when taken together, the results are instantly noticeable. 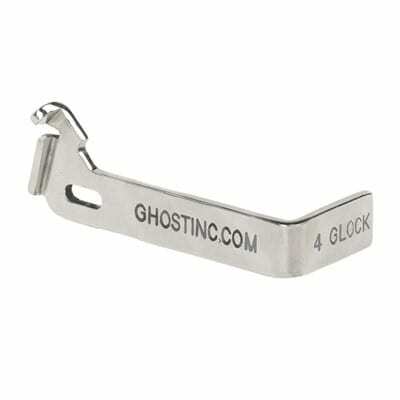 In short, Glock owners who don’t like the somewhat gritty pull they get with their stock trigger connector will feel much more like they’re “one” with their Glock after installing this trigger connector. Additionally, the incremental adjustment to the pull pressure is very easy to acclimate to, meaning results are almost instant. This trigger connector is perfect for those who have never replaced the part from their stock before. If you’re not sure whether a trigger upgrade is for you, try out the trigger connector Ghost offers at a 4.5-pound pressure to see what this part can do and how your accuracy improves. From there, you can continue to fine tune. For those who are on the fence about upgrading their trigger connector or would like to see what an improved component can do, the Ghost 4.5 Ranger Trigger is an excellent option, as the improvements are easy to adjust to but also highly noticeable. Our last trigger connector from the exceptional line produced by Ghost, the Edge 3.5 Trigger Connector is yet another worthy consideration. While it offers the same pressure level on the trigger pull as you get from the Rocket model, both having 3.5 pounds of pressure, the Edge offers a unique advantage in the form of a design that eliminates the “bump” you get at the beginning of the trigger pull. What we’re talking about is that jarring, sudden resistance that immediately interrupts the smooth flow of your pull. 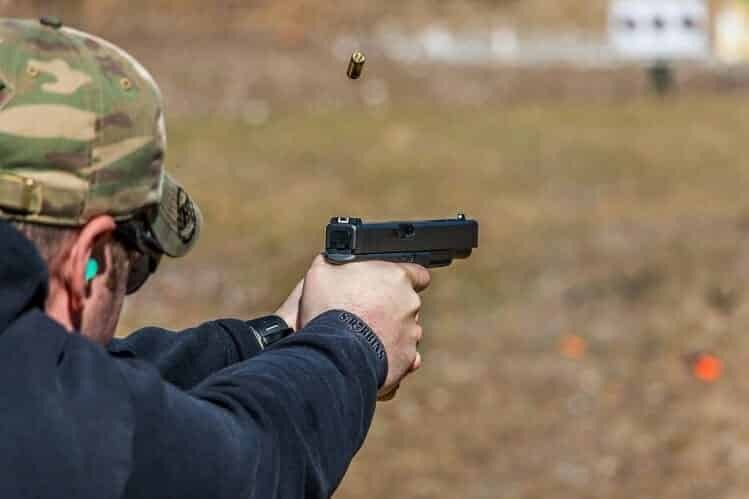 As you would expect, this minor change makes a world of difference and ensures that from the split-second you decide to move your finger to the moment the bullet leaves the muzzle, there is zero unexpected resistance beyond the 3.5 pounds of pressure. If you’ve read the other Ghost product reviews on our list, you know that their trigger connectors also provide exceptional smoothness in the pull. 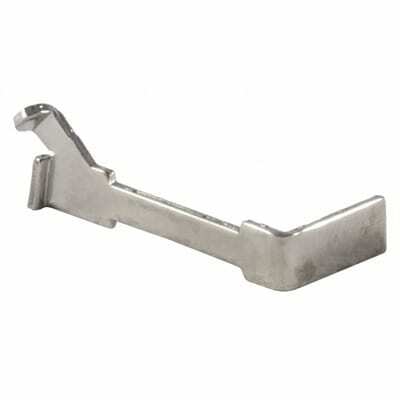 This trigger connector is no different, as it removes the problem of a gritty feeling in the stock trigger connector. Combining this smooth operation without the initial bump provides an exquisite pull that really has to be felt to be believed, but trust us—your shooting accuracy and recovery time will enjoy a huge boon. Like any trigger connector that drops the pressure down to 3.5 pounds, it will take getting used to. You will need to retrain your muscle memory, which may take a session or two at most. Once you do, however, you will wonder how you ever shot with your old trigger connector. As with all Ghost trigger connectors, this part is made from high-quality stainless steel for long-lasting performance. For the absolute best shooting experience that Ghost offers, with lightning-fast recovery time, silky smooth pull, and no “bump”, the Ghost Edge 3.5 Trigger Connector is your best bet, even if it takes getting used to. Stepping out of the Ghost Inc bubble, we have Lone Wolf Dist., who is well known for making many high-quality parts. They bring that reputation and innovation to their trigger connectors for Glock, too. Featuring a complete redesign of how the part operates, this connector is a bit different from previous entries. Here, Lone Wolf implements spring weights and a completely different set of geometric angles. The bottom line for these changes is markedly improved smoothness to the pull and the spring adds a very subtle gradation to the pressure. While the pressure is 3.5 pounds of weight, this gradation in the spring eases into the weight. The feeling of spring-based resistance is very intuitive and helps to keep the minimal weight from feeling too loose, which may be a concern of some gun owners. Of course, at only 3.5 pounds of weight, it’s still going to be more suited for sport than concealed carry, but this makes it a lot quicker in reformulating muscle memory. Lone Wolf has also reduced the slide’s thickness by 25%, which provides very fast reset action. Additionally, they’ve provided a built-in debris channel, which ensures that this part not only operates smoothly, but resists malfunction. Combined with the stainless-steel construction, you’ve got a durable, long-lasting product. For gun owners who’d like a fast, 3.5-pound pressure on trigger pulls for competitive shooting but want a faster, more intuitive pull, the complete spring-based redesign Lone Wolf offers is a great alternative. Our last product on the list is another great entry from Lone Wolf, Dist., but this time it’s a more traditional design than the spring-based innovation before it. That doesn’t mean it’s not an excellent trigger connector, though. Here, the gradation on the pull from the previous design is dropped in favor of focusing exclusively on smoothness. At 3.5 pounds of pressure, it provides the same resistance. However, this trigger connector is 25% lighter and features a polished, nickel-plated surface, which minimizes friction when striking or working against other internal components. Additionally, this construction also means that the trigger will reset much more quickly. You’ll enjoy faster follow up shots, but you’ll also be less tempted to follow poor form and jerk your trigger, reducing your accuracy. One benefit to using the traditional design that Lone Wolf offers is that it is modular, meaning that you can add Lone Wolf’s Ultimate Trigger Stop (which is sold separately) to fine-tune where your trigger stops. If you noticed from our other reviews, this modular, product-compatible design is not present in other products, meaning you get a trigger stop or you don’t. You may not want the other features of trigger connectors with trigger stops, so this provides the ability to fine-tune your pull without too much hassle. Additionally, because it uses no additional parts and requires no alterations to your Glock, it’s very easy to install and swap back out with another connector if you so desire. Made from stainless steel, with the aforementioned nickel-plated surface, it will not only operate smoothly, but will continue to do so for a long time to come. For those who’d like to go a step further in customizing their trigger pull, the modular design of this exceptionally-smooth trigger connector makes for a great choice. Now that you know what a trigger connector is and how important it can be, and you’ve found the right replacement for you, let’s look at how to swap your old one out for your shiny new connector. The process is actually fairly simple, but be sure to follow along with our video while reading the following instructions. As always, verify that your Glock is unloaded. Push the locking block pin out of your receiver. Using a punch, remove the trigger pin. If you encounter difficulty, try moving the trigger forward. You may also wish to use a vise to make maneuvering a little easier and free your hands. Take your punch and insert the tip below the locking block to remove it. Push the trigger housing pin out with your punch. 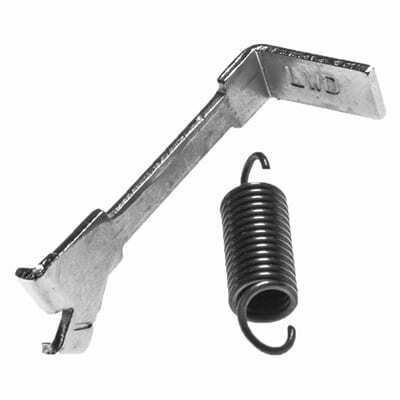 Remove the trigger assembly by using your punch on the ejector. Pull the trigger forward and rotate the trigger bar clockwise, then lift the trigger bar from its housing. Unhook the trigger bar spring, taking note of how it attaches. Remove the connector. Make this easy by using another connector to push it out. Insert the new connector into the housing and hook the spring on the trigger with the bar, then insert it all back in the trigger housing. Reassemble your pistol the same way it was taken apart but in reverse. However, be sure the first thing you do is put the locking block pin in. You now have a new trigger connector—your next step is to try it out and get used to the new feel! Now you know what a trigger connector is, why upgrading is important, and how to determine what type of replacement trigger connector is best for you. We’ve provided a list of the best trigger connectors on the market and if you keep our guidelines in mind, you’ll have a faster, more accurate shooting experience in no time! Just be sure to follow our instructions on how to install it properly and enjoy your new trigger connector!